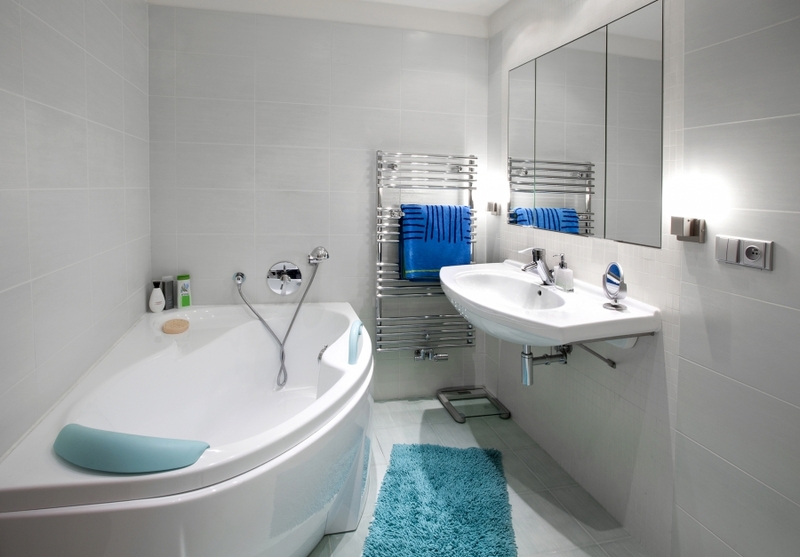 One room in the home that often receives little attention during the home renovation process is the bathroom. This small, private room is often thought of as a utilitarian space with little thought toward comfort. Home design has evolved to help make every room in your Michigan home amazing, and the lavatory is no exception. 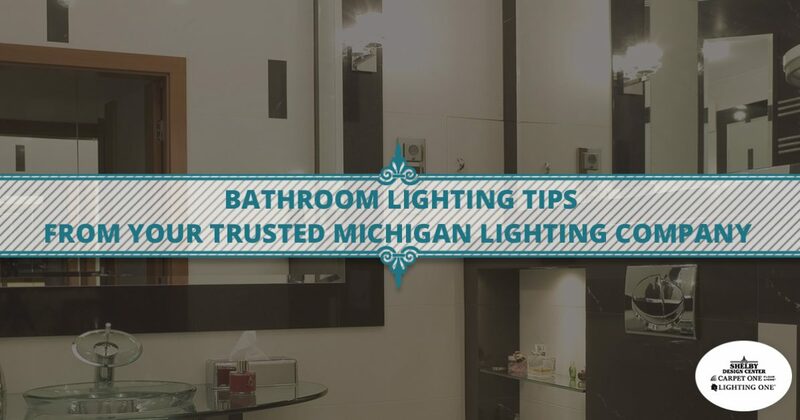 In fact, modern lighting designs often place a heavy emphasis on turning your restroom into a sanctuary, as this space is used for a wide range of daily activities. With minimal room, reflective surfaces such as mirrors, and the need for optimal lighting, it can be hard to find the perfect solutions for your home. If you’re in need of an experienced lighting company in Shelby Charter Township, our home design pros can help out! The Shelby Design Center is proud to be your comprehensive source for quality design solutions, working with Lighting One® and Carpet One® cooperatives to provide the best style choices from a nation of suppliers. Our retail lighting staff is here and ready to offer professional help to back up our quality products. Home lighting can be a fun project, but remember that the bathroom is often the space with the highest chance for error. Today, we’ll highlight a few tips that may help or inspire you with our own home improvement project. If you’re in need of help, be sure to stop by our lighting showroom to find the perfect style for your home! Much of the bathroom is built around your vanity mirror, providing reflective support to help you prepare for the day ahead. The biggest challenge with bathroom lighting is designing a system that minimizes shadows while completely lighting your beautiful visage. It can help to start with the location of your fixture. Our contemporary lighting solutions can be utilized on nearly any surface to provide versatility to Michigan homes with unique needs. Above. Placing a light above the vanity is a classic approach, but remember that downcasting shadows can be common with one high light source. Be mindful of ambient lighting to enhance any problems with this approach. Many fixtures come with shades or diffusers to minimize intensity and glare. Beside. Placing wall lights such as sconces at eye level makes this the best approach for most bathroom lighting plans. Placing a light on each side will help to provide all-over coverage and minimal shadows. Recessed. While not as commonly seen, recessed lighting can be effective for those looking for a unique way to enhance their bathroom. Placing these modern lighting elements along the glass can help to provide illumination where you need it most. Recessed lights can also be utilized with other fixtures for more balance. On the mirror. This specialized approach is ideal for homeowners with large mirrors and limited space. Since your lighting fixture will be directly on the glass, it’s important to find a style that looks good from all angles, as the mirror will provide plenty of views. If your contemporary lighting sits flush with the mirror, you can expect the same level of quality with this unique approach. Take the time to tweak the location of your new fixtures to ensure the best fit for your needs. Vanity lighting that matches your height will make everything better. Despite our focus on vanity lighting, it’s important to remember to layer the illumination in your bathroom for the most quality, comfort, and versatility. Bathrooms rely on varying levels of light, from relaxing soaks in the tub to makeup routines for big events. As such, it’ll fall on you as the homeowner to enstate a balanced scheme that looks great. If you have the space, a large range of projects are available to create long-lasting beauty and convenience. Placing a small chandelier above the bathtub, for example, can enhance a space while providing a comprehensive level of ambient lighting. Sconces and wall lights are often ideal for task lighting, whether you’re plucking your eyebrows, cutting nails, or so on. Recessed lights and flush mount ceiling fixtures all constitute a range of choices for the discerning homeowner. As always, dimmer switches are a cost-effective option that can give you total control in finding the perfect level of light for your varying activities. One key aspect to proper bathroom lighting that many homeowners forget about in the excitement is the color and temperature of your fixtures. Natural light is great, and many homeowners look to find comfortable illumination that doesn’t feel out of place. When it comes to your vanity, it’s also important to capture this tone because you want to know what you’ll look like out in public. Similar to stage lights, improperly placed bathroom fixtures and bulb types can change the look of your face, inconsistent with how you’ll appear in the daylight. Our lighting store provides a wide range of options to choose from, and our staff can help you to find the right type of fixture for your bathroom. The Shelby Design Center is here to deliver comprehensive assistance for Michigan homes and businesses. Our lighting company in Shelby Township is proud to offer comprehensive design solutions for projects of all sizes. Contact us or stop by our lighting showroom for help!